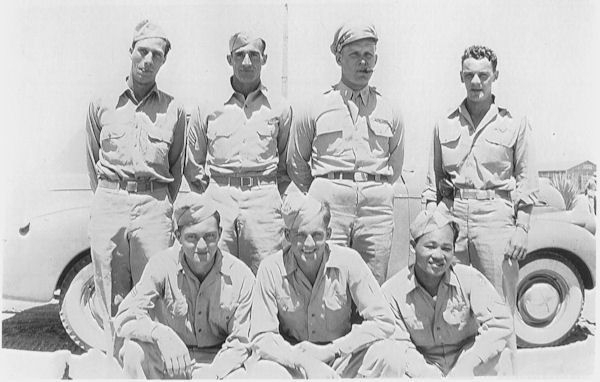 Lt. Simpson and crew were assigned to the 752nd Squadron in the middle of the group’s Truckin’ missions, hauling gasoline to Patton’s army in France. The group had been pulled off of combat operations on September 12th, along with the rest of the 96th CBW in order to fly gasoline to the fast-moving American forces. Some of the crew may have participated in a few of these gas hauling operations, but no records have yet been found to show which crews took part. George Douromes, according to his diary, flew on at least three at the end of September. 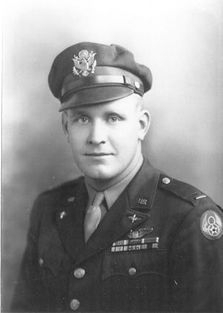 2Lt Harold Coburn, the crew’s navigator was assigned to fly to St. Dizier with the crew of 2Lt George Koehn. They landed and unloaded their gas on September 23rd, but remained at this airfield until September 24th. They took off, but never made it back to Horsham St. Faith. It was only after the war that it came to be known that the crew had strayed over German flak guns and had been shot down, only one gunner surviving and becoming a POW. With the loss of their navigator, records indicate that Lt Michael Horniak, the crew’s bombardier, made the switch to navigator. He is shown on crew load lists as flying in that position. While Simpson’s first mission is listed as October 7, 1944, it is very possible that he flew prior to this. George Douromes diary entry for October 5th states, “heated flying suit went out and I go to the hospital for five days, grounded for five more.” His next mission was on October 16th, but apparently not with Simpson’s crew. Douromes received orders the next day to attend RCM School at Cheddington (AAF 113). He was shortly reclassified as an RCM Operator (MOS 866) and began flying with various crews, although never again with the crew on which he trained. Meanwhile, Simpson and crew continued flying missions in the 752nd, amassing a total of 13 before 1944 came to a close. 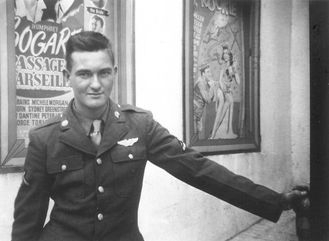 Sgt Robert I. Sinn, a gunner who had been assigned on July 29, 1944 on the crew of 2Lt Thomas G. Horgan, replaced George Douromes as gunner. 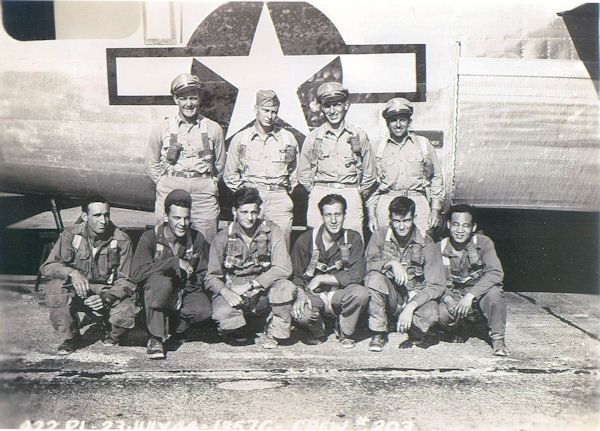 Horgan’s crew had been shot down on September 11, 1944. For a wing crew, Simpson's missions were spaced out, with several days in between. They flew six missions in January, and only four in February, one of these on the 22nd to the marshaling yards at Peine-Hildesheim, Germany. On this date, their position in the “B” Group second squadron was to the rear of the “A” Group second squadron. It was in this latter formation that S/Sgt George Douromes was flying with Lt Joseph E. Szarko’s crew, ahead of Simpson. At 1247 hours, about 15 minutes from the Initial Point, Szarko’s ship took a direct flak hit to the right wing, snapping it off, the ship going into a spin. None of the ten man crew survived. During the month of March 1945, the crew became really busy, flying the remainder of their missions prior to the 24th. 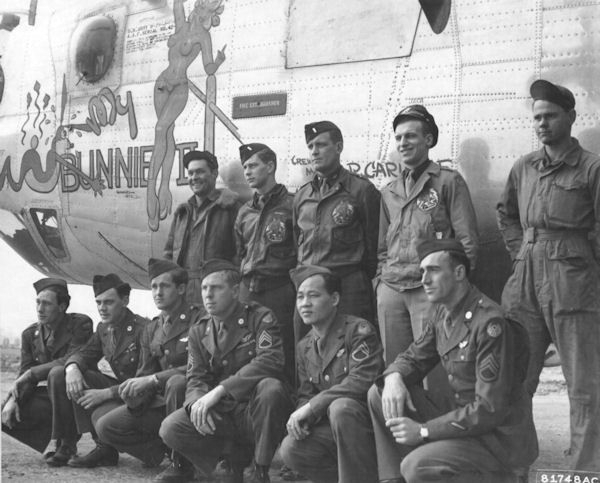 These last ten missions were all flown in a B-24J named My Bunnie II. The crew had flown this aircraft on three prior occasions in 1945, but during this home stretch it seems as if this was definitely “their ship”. This aircraft’s crew chief, received mention in the 752nd Squadron Engineering notes in April 1945 for his exemplary performance, “M/Sgt Carlisle, A.R. at present, crew chief of A/C 42-51270 has reached fifty-six missions without an abort for any mechanical reason. His assistant has been Cpl. R.R. Terrell.” The crew is pictured with both of their ground crew below. Sgt. 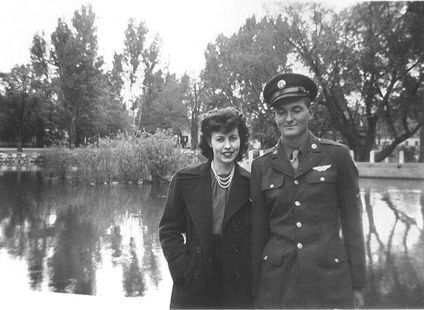 George Douromes, son of Mr. and Mrs. James Douromes, 1118 Story Street, who has been overseas the past six months, serving as a gunner with the U.S. Air Force, based in England, has written the following cheerful letter to his parents. “When you read in the papers about a thousand plane raid, it’s just words, but when you are part of one of those planes, looking at the rest of them, it’s wonderful! You can’t realize the thrill it gives you. There you are, five miles above the ground, and all you can see is big, white, beautiful clouds below, and pale, blue sky above. You are free as a bird, and you are sitting on top of the world. It’s as safe as being in your mother’s arms – but sometimes you wonder! Some people like the small planes, but not me, give me a trim, graceful Lib and that’s all I want. When we don’t fly, we sit on the ground and dream about it. The weather has been sort of bad lately, so we just have to dream. You wrote and asked me what a mission was like, so I will write an example. You are lying there a million miles away. You are eating ice cream and drinking beer, beating off blondes with a club. There’s a redhead sitting on your knee when that nasty man shines his light in your face and says, “Time to go to work! Eat at once, brief in forty-five minutes”, so you get up. It’s cold as heck and you find your way to the mess hall. The cook will cook you a couple of eggs and you sit down and eat, ‘cause God only knows when you will again. Then you’re still half asleep, find the briefing room, light up a smoke and wait. Then the briefing officer starts to talk and you listen. Every word may mean life or death to someone. He tells you the target. How much flak. How many fighters to expect. Your own fighter support, and so forth. Then you pray, pray like you never prayed before. Then you dress, it is cold up there. Take your glove off for a minute you lose some fingers; for two minutes and you lose a hand. You check everything again, and again. Then you catch a truck and get out to the ship. You find your guns and put them in and check every little part. You grab a smoke and wait for the tower to flash your takeoff sign. You are looking for fighters and you see plenty of trim little Mustangs, and big ugly-looking Thunderbolts, but you’re looking for “Herman the German”. Then that voice again, “Ten minutes from target, put on the flak suits, boys.” You put it on and wish you had a hundred more. Then, there it is -“flak” the first burst edging its way towards your formation, and then all hell breaks loose. It’s all over the sky, so thick you could get out and walk on it. The “bombs away”, our job is done. Let’s get home. Slowly the formation comes out of the flak and starts for home. Then you see “Herman the German”. Away off to your right, but there are a couple of planes after him. Then that voice again, “leaving enemy coast”. You don’t relax, you wait and watch. The formation is losing altitude so when they hit the coast of England, they can land quickly because gas is low. You are down to 12,000 feet, so you pull off your oxygen mask and grab a smoke, your first in six hours. Then there it is, you strain your eyes to see it. It’s getting closer and closer. It’s in plain sight of everyone – The English Coast. (I have seen mountains, valleys, lakes, trees, and the sea, but there has never been and never will be anything as beautiful as that!) You lean back and start to joke and relax and before you know it you’re over your field and coming in. You get out and look around and pinch yourself, but the truck is waiting to take you in to get something to eat. Then, like a man, you go drink your whiskey and stagger into interrogation, make your way to chow and go clean your guns and hit the sack. You lay there, light up a smoke and smile; you want to laugh, anything but sleep. But you do. You sleep well and long because you feel good. You did something. Well, anyways, you ‘helped’ do something. There’s that redhead, that’s been waiting and those blondes, and that’s a mission. “I have heard that you received a telegram from the War Department stating that George was missing in action. I need not mention my feelings, because I thought more of George than any friend I ever had. He and I always got along very well together. He used to go with my wife and me on our passes back in the States. He always talked about you folks and his sister. He was certainly proud of his family and I feel I know you personally from what he said of you. Our friendship wasn’t as officer and enlisted man, but rather as brothers. I was the big, older brother and he was the younger brother. “George had done so well on my crew that when a special assignment came up, he was picked to attend a special school and was then assigned to fly with various crews. I was not happy when he was taken off my crew, and I personally went to the colonel to try and keep him. It seems the army always has a better spot for a good man, so my efforts to keep him on the crew were of no avail. He had been flying with the other crews doing his special work for five months, so he wasn’t on my crew very long after we got over there. “I was flying behind his squadron on the day that his ship was hit and watched them go down. It is never a pleasant sight, but we have to feel that those men made a sacrifice to save hundreds of others. I know George stayed at his post and worked all the time. He had more nerve and spirit than I will ever have. I know that God is ever watchful of the good men and so He takes the good ones to create a suitable heaven for the rest of us. I do realize it is very hard to lose someone we really love, but then how do we know but what they are the lucky ones and we on earth are the unlucky ones? What greater glory could a real man like George ask than to be given the chance to make our United States safe from any harm or invasion? “I was always happy with George on my plane, because he really knew his job and he always did his best. I have never seen a man (I always say man, even though George was so young) who could shoot like he could. He could really make that turret talk. He knew the plane too, and was assistant engineer on my ship while he was on my crew. “On my way home, I plane on stopping for a visit with you folks. We can have a nice visit and things can be explained much better than they can by letter. You folks should be the proudest in the world to have had a fine a son as George. He was a fellow that you don’t find very often. I really liked him a whole lot. Until I see you folks, I will close for now. I am very anxious to meet George’s family."